Manila, Philippines, 5th of November, 2013- Microsoft Philippines formally launched the Imagine Cup 2014 Local Finals in the country along with the partnership of Microsoft Philippines and the Department of Science and Technology (DOST) Information and Communication Technology Office (ICTO) to further help student participants to focus on how to develop and emerge with the right software that will solve particular government related problems, as part and parcel of Imagine Cup’s goal- and that is to help solve the world’s toughest problems. The event was preceded by an introduction from Ms. Karrie Ilagan, Microsoft Philippines General Manager stating statistics of Imagine Cup, which is currently on its 12th year as the world’s premier student technology competition. So far, there are over 1.65 million students from 190 countries have participated in throughout the entire Imagine Cup history, and among these figures, 1,000 Filipino students have participated already and took the Imagine Cup challenges. Eligible students to the competition are invited by Microsoft to fully use their imagination and burning passion to create technological breakthroughs that breaks a new ground, solving the toughest problems that the world is facing today. 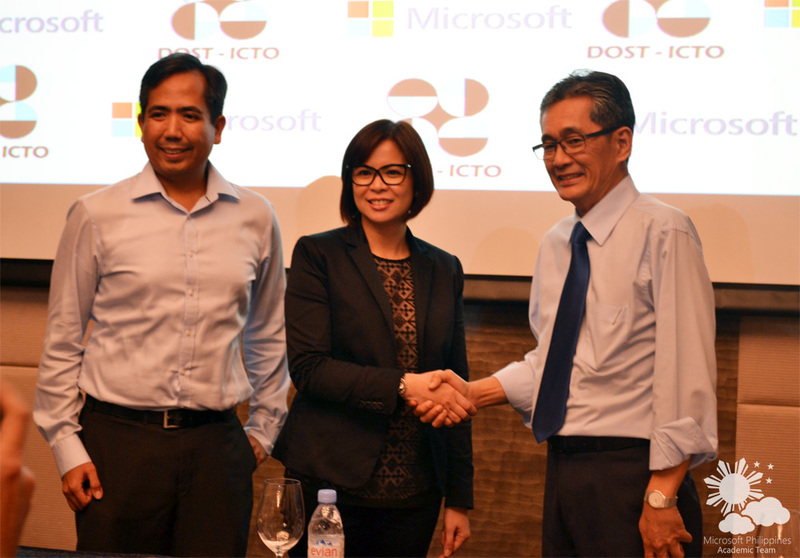 As part of the partnership of Microsoft Philippines to DOST-ICTO, Mr. Mon Ibrahim, the Deputy Executive Director of DOST-ICTO stated that there are a lot of great talent in among the Filipino software developers. The government organization also stated that they have crafted a long list of priority problems hoping the aspiring Imagine Cup participants could focus on, and among these problems, three major priority sectors were highlighted, namely health, environment and e-government. In a worldwide scale, Philippines is considered to be one of the largest supplier of IT talents in the world, but Mr. Louie Casambre, the executive director of DOST ICTO stated a realistic statement in his opening remarks that despite the large number of IT talents that we have in the world, we still don’t have an Apple or a Microsoft. Above all, the Imagine Cup has been an avenue to harness the skills of the students from the ICT field, and within its existence, it has opened a lot of door of opportunities to the competitors, whereas their projects became their key towards success in their respective careers and some teams actually went on pushing through building start-ups, improving the craft of their projects and immediately turning these start-ups to the enterprise level. Ms. Katrina Macaraig, the Audience Marketing Manager of Microsoft Philippines introduced the flow of the Imagine Cup 2014 local finals and highlighted the major dates and deadlines of the competition. The Imagine Cup Local Finals Philippines 2014 (In person) will be held on April 12, 2014. Former participants of the Imagine Cup competition also shared their personal experiences and some tips that can help the aspiring Imagine Cup participants to solve some of the toughest problems that we are facing in the world, and in the society. An Imagine Cup 2010 and 2011 Worldwide Finalist, and graduate of DLSU College of St. Benilde, Mr. Marion James Pilande shared his experience for being part of the prestigious competition for two consecutive years as a representative of the Philippines, that being in the Imagine Cup worldwide finals was not purely an intense and serious kind-of-a competition. The competitors will be facing the judges on the first days of the Imagine Cup worldwide finals week, and they will be exposed as well to expand their connections, since they will also be presenting their projects to other companies who will attend the worldwide finals on a showcase day. Moreover, Imagine Cup is a celebration of world’s greatest innovators of our generation, the competitors are also given the chance to explore the host country to the so-called worldwide finals’ cultural day and attend series of parties within the dates of the worldwide finals, thus, making the entire journey, a roller coaster like experience, rather than just a serious kind-of-a competition. Mr. Paul Villena, a Microsoft Philippines DPE intern, Microsoft Student Partner, and an aspiring Imagine Cup competitor from Adamson University, shared his sentiments on why he joined the competition, he said that Imagine Cup is a training ground to harness his skills in app development, in creativity, and as well as to be a catalyst of change, in terms of helping solve a particular problem that we are currently facing. Ms. Gigi Adamantopoulos, a Microsoft Student Partner from De La Salle University, and a former Imagine Cup competitor shared that Imagine Cup for her, was a learning experience and an avenue, not for just developers per se or creative designers in particular, but also to sound editors, where she expressed that as long as you have the skills to contribute to the team, you can still join Imagine Cup, plus the success of the team is measured by the joint effort of an entire team, therefore, teams who will be joining must first have unity and camaraderie instilled in their cores, and together, combine everyone’s talents, in order to achieve goals and surpass the challenges of the Imagine Cup competition. Mr. Cesar Cuaresma, a Microsoft Student Partner from the University of the Philippines- Diliman, also a former Imagine Cup competitor whereas, his team made it the Imagine Cup 2012- Windows Phone category top 100 world finalists. He shared that the Imagine Cup was a way for him to practice his skills in programming for mobile phones, Windows Phone OS in particular and as well as improved his confidence in building programs in mobile phones. “Microsoft’s Imagine Cup is vital to promoting the science and technology capability of our student developers in achieving innovations that are geared towards delivering economic and social benefits,” Indeed it is, Mr. Casambre said. “We look forward to more partnerships like this with Microsoft in order to sustain the development of programs that harness the talents and skills of Filipinos in science and technology,” he added. Now that the Imagine Cup 2014 Local Finals has finally kicked off, Microsoft Philippines and DOST-ICTO look forward to see the amazing projects of the talented Filipino students in the coming months. So to all aspiring Imagine Cup competitors out there, the opportunity has arrived, it’s time to step up and take the challenge, live that dream, and believe in your capabilities, Join Imagine Cup 2014 and who knows, you and your team might be the next one to bring home the Imagine Cup from Seattle, Washington to the Philippines. Gabriel Villanueva is your Imagine Cup 2014 Local Finals- Philippines Insider. He’s your Microsoft Student Partner from Treston International College, currently taking up a degree in Computer Engineering; also the Microsoft Student Partner Social Media Lead for Microsoft Philippines Academic Team. He’s also a Certified Microsoft Certified Professional, and is one of the youngest tech bloggers in the Philippines to be nominated at the prestigious Philippine Blog Awards 2011 with his blog, The Ultimate Cyborg for Best Tech Blog Category – National Level.